Standing on an awards podium to be recognized for your efforts is a great feeling. It fills you with pride and instills confidence in you. It’s something that everyone should experience. An even better feeling is when you get to help others achieve that dream. 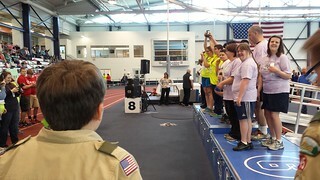 That’s why the Regional Special Olympics is such an awesome event for our troop. For the second year running, we had the opportunity to come out to help at this wonderful event. We had a few main areas where we helped this year. About half of our boys helped kick things off by accompanying athletes as the Olympic torch worked it’s way around the building. But most of our boys devoted their time to crowd control and gathering the athletes. 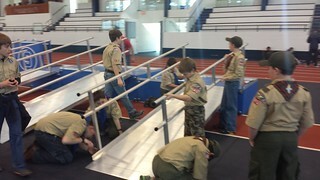 Even our youngest scouts were put in charge of lining up and leading over a hundred participants, each. Then, they led them around the track in the opening parade. 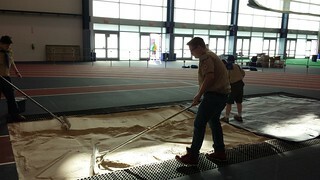 I heard numerous comments from the athletes that showed their excitement that the Boy Scouts were helping at this event. But I’m pretty sure we enjoyed their presence, even more. Two of our boys spent nearly the entire 7 hours on their feet, placing medals around the necks of the participants. They enjoyed it so much, we couldn’t pull them away. While we were involved handing out sandwiches, construction/teardown, prepping events and gathering people, the most important thing we did was to share celebrate and share the excitement with some really wonderful people. 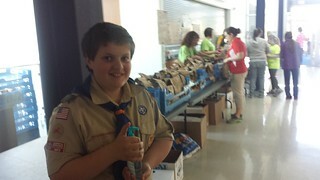 I think every one of us walked away excited about this awesome service project.